2014 has been the unofficial year of the crossover, with series-spanning jaunts for both superheroes and animated families. But it’s doesn’t end here, as 2015 will kick off with a Mythbusters season premiere featuring hosts Jamie Hyneman and Adam Savage taking on The Simpsons. Woo-hoo! For its Season 13 opener, Mythbusters is taking a look back at some crazy, but not too crazy, moments from the longest-running sitcom in TV history. Savage himself shared with EW two of the key scenes they’ll be trying to recreate. We set out to test Bart throwing a cherry bomb into the toilet that makes all toilets in the school act like geysers. And then there’s one in which Homer’s house is about to be destroyed by a wrecking ball and Homer places his body between the wrecking ball and the house to keep it from being destroyed. The first episode he’s referring to is Season 1’s “The Crepes of Wrath,” while the second reference comes from Season 5’s “Sideshow Bob Roberts.” As you can imagine, the duo won’t be handling some of the more extreme gags the series has delivered, such as Homer’s seemingly endless fall through Springfield Gorge. After all, the wrecking ball stunt alone sounds like one of their more complicated ventures. Savage explained that they looked all over the West Coast to find a house that was about to be destroyed, so that they could demolish two of its sides, but they couldn’t find anything. So they did this instead. 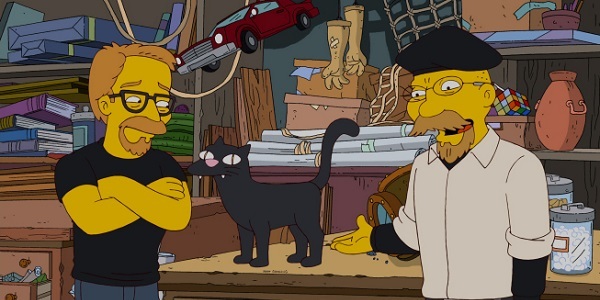 Hyneman and Savage are no strangers to the world of The Simpsons, having appeared as themselves in the Season 23 episode “The Daughter Also Rises.” Here’s hoping they got some of the show’s animators to add a little something special to the Mythbusters episode. The mustache budget alone would be extreme. The Simpsons has already paired up with Futurama and Family Guy in recent months. And even though we won’t actually see any of the Simpsons family beyond fake Homer, this sounds like one hell of a great crossover. Mythbusters will return to Discovery in January 2015, and will have a few more themed episodes as well, including ones based on Breaking Bad and more Indiana Jones myths.